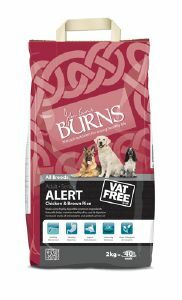 Increased levels of antioxidants and added salmon oil make the Burns Alert range ideal for dogs performing tasks that require them to be calm, alert and attentive. This delicious, premium quality food is formulated with carefully balanced ingredientsm to provide all the essential nutrients your dog needs for lifelong health and vitality. When used as a general maintenance diet it can help to maintain healthy skin, coat and digestion. Also suitable for the management of many dietary related health problems.